These old 'Grade 2' dairy buildings had been abandoned for many years. An architect I have worked for many times before asked me to price for the work. I was supplied with a detailed specification as a Quantity Surveyor was involved with this project. The building needed completely stripping back to the basic frame. 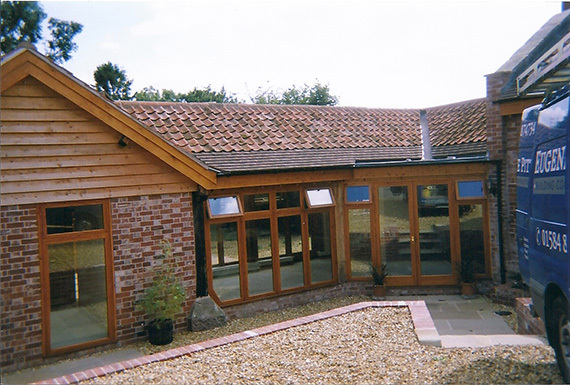 After putting floors into the building we had to construct a new oak frame for a glazed link between the two barns. We then put a new roof on the building and made in watertight so work could continue indoors. The building had split levels so I commissioned a local Carpentry and Joinery business to make two sets of oak steps. Internal stud walls were needed to create rooms. We then began with the fitting out of the property. Plastering walls, fitting a kitchen, plumbing for three bathrooms, a new central heating system, tiling, glazing, decoarating and we even lanscaped the outside area. I received a great deal of very positive feedback from professional people who came to view the property.